After the sad demise* of Digg, Reddit has become the most popular social news website on the internet. On the desktop, you can use tools like the Reddit Enhancement Suite to, well, enhance your Reddit-browsing experience, but on Android, the mobile website doesn’t offer as smooth an experience. 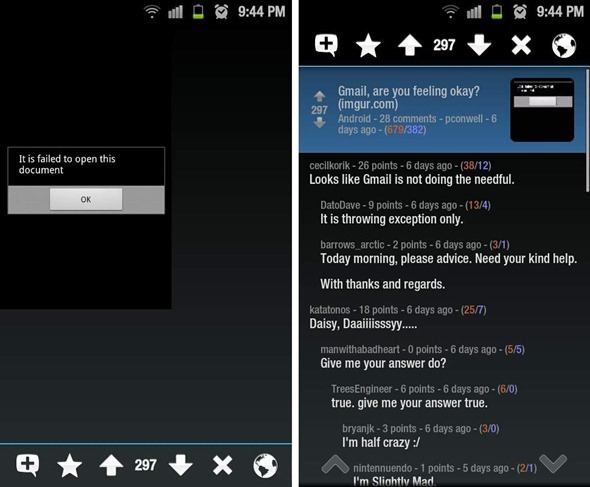 Because of this, native Reddit apps for Android are popular among redditors on the go. I’m an Android smartphone-toting redditor myself, and so I have tried just about every Reddit app for Android ever since I got myself a Galaxy S II a few months ago. My search for the best app started with reddit is fun [Market Link]. While it did offer some pretty useful features, it’s user-experience wasn’t the best. 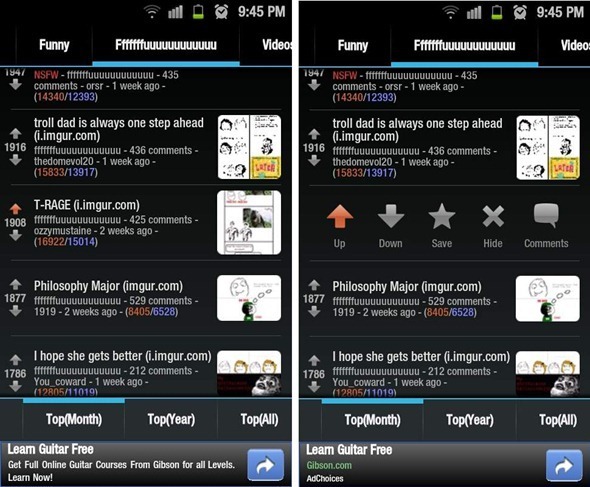 I then tried apps like F5 [Market Link] and Baconreader [Market Link], but they didn’t quite click with me. Ultimately, I tried Reddit News on the recommendation of a fellow redditor and I’ve been using it ever since! Just because of a handful of neat UX tricks, Reddit News offers, in my humble opinion, the absolute best redditing experience on Android**. 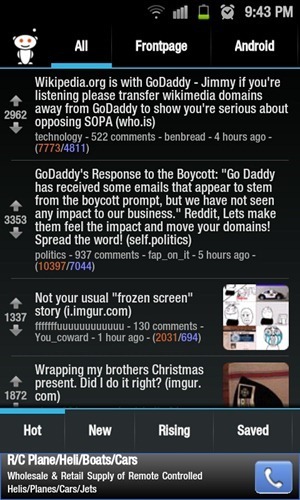 – A horizontally scrolling subreddit list combined with a vertically scrolling stories list on the same page. – Drag and drop sortable Subreddits, move your favorites to the front. – Easy access to comments on a story through a sliding drawer on the same page. – Optimized portrait and landscape layouts. – Rage faces in comments. Once you spot a link you’re interested in, you can tap on its thumbnail to go straight to it. Once you’ve seen the link, you can just swipe up the link submission drawer to view the submission’s title as well as comments left by other redditors. This means you can switch between viewing the link and reading the comments thread on-the-fly (which isn’t quite the case on other apps). The second kickass UI feature is how you can swipe a submission’s box to the left to reveal five regularly-used options related to the link: you can upvote, downvote, save, hide the submission or go to its comments section. This, along with the smooth transition from submission to comments thread is basically what makes Reddit News my favorite Reddit app for Android: regularly used actions aren’t more than a swipe or a tap away! For folks who actively submit links on Reddit, Reddit News does have one limitation: you can’t submit links. This isn’t a problem for me***, since I don’t submit often, but it may be a deal-breaker for some you. **Granted, I haven’t tried Reddionic yet. But it’s in closed alpha state right now. ***I strongly believe that smartphones and tablets are content consumption devices. Content creation is for desktops and laptops!